Few would dispute that the violence of war is one of the most horrific experiences to which the human community is exposed. Yet, in modern journalism discourse, we have tended to objectify war to a safe, sublimated distance. In effect, we have made of war a euphemism, which, as the poet Joseph Brodsky observed, “is, generally, the inertia of terror” we do not wish to acknowledge. This is why some journalists turn to literary journalism to account for war, and why the genre is so necessary, even critical, because it helps us to perceive better through the aesthetics of experience the monster of war we have created. This project proposes first to establish the parameters of the term literary journalism (creative nonfiction, realistic novel, memoir, reportage, journalisme d’immersion, etc.) and the notions of war (not only ‘hot’ wars or ‘cold’ wars but also other conflicts, such as cyber wars). Second, it will examine how those wars have been covered differently by literary journalism than by the traditional press. Third, it will analyze various examples of literary journalism from countries around the world to see if literary journalism unifies the humanities in how it covers war, all the while the war that is being covered divides us further from each other. Topics included will be case studies of wars from colonialist Africa to World War I and from Russia’s involvment in Chechnia to America’s military engagements during the Arab Spring. Research in the form of conference presentations, seminars and book and journal publications (a special issue of Literary Journalism Studies will be edited) will examine how literary journalism tries to balance the bloody with the banal in war reporting. The long-term project will be to disseminate the project’s research findings to various communities. An online, interactive website will provide a database of literary war journalism written throughout the world. Internauts will be able to click on a country in Europe or Africa, select a site where a war was centralized, and access the various literary journalistic pieces written about that particular site by literary journalists of multiple nations. Additional media will be made available as well, including manuscripts, notebooks, letters, photos, and videos linked to the war and the journalistic piece. Following up on a recent book, Literary Journalism across the Globe, which tried to define literary journalism in an international context, this project would put that book to practical use in using some of its theories in application to war coverage in the nontraditional press. As of now, there is no research center in the world that deals exclusively with literary journalism as a research object, let alone with literary journalism and war. In November, during his second year as visiting “Chaire Franco-Brésilienne,” John will deliver the opening keynote address at the 16th Encontro Nacional de Pesquisadores em Jornalismo, organized by the Associação Brasileira de Pesquisadores em Jornalismo (SBPJor). The conference title is “Pesquisa em Jornalismo: dos conflitos em pauta aos conflitos em campo/From agenda conflicts to conflicts in the field.” During the conference, he will also participate in a panel where he will deliver the talk “Literary Journalism as an Academic Discipline: Weighing the Pros and Cons.” This talk will be about the special issue on literary journalism of the Brazilian Journalism Research journal that he is co-editing with Monica Martinez from the Universidade de Sorocaba in Brazil. Following the conference, he will partipate in a panel organized for the 1st Brazil-France-Francophone Belgium Journalism Research Conference, where he will present the JorLit and CRONICA research projects. Also in November, John was invited to speak at the seminar “Entre la zone de combat et le front narratif : la quête de pérennité du reportage littéraire de guerre,” sponsored by the research center CELIS of the Université Clermont-Auvergne, where he will give a detailed report on the last five years of the ReportAGES research project. Also in December, John and Prof. Monica Martinez, from the Universidade de Sorocaba in Brazil, co-edited volume 14 (no. 3) of the journal Brazil Journalism Research entitled “Literary Journalism as a Discipline.” The special issue, which includes original research from twelve leading international scholars of literary journalism studies (from the United States, Brazil, England, Sweden, Poland and Chile), spearheads the debate on literary journalism’s disciplinary status by offering contrastive views of its nature as a literary technique, a journalistic genre, or an academic field of inquiry. The year 2019 opened with some exciting news: the three-year project proposal, CRONICA: “Comparative Reportages: An Ontology of French Narrative Journalistic Influences and Dialogue in Chile and Argentina,” was accepted. John, along with a French consortium, will be working with colleauges from the Universidad Academia de Humanismo Cristiano in Chile to explore the roots of French literary journalism in Latin American crónica or testimonio – with its trademark immersion reporting and narrative rending of fact. In May, Patricia Poblete will come to Nancy to conduct research on the chronique juridique from the 19th-century French press and deliver a talk on 23 May: “Mario Rivas: social crónica, humor and satire.” More on the project, funded by ECOS Sud 2018 (France) and CONICYT (Chile), can be found here: http://www.univ-paris13.fr/cofecub-ecos/ecos-sud). In March, a revised version of the four-year research project, JorLit, was submitted to the ANR PRCI with a new focus and an expanded consortium. Three research centers from France (IDEA, RIRRA 21 and GRIPIC) will join forces with four universities from Brazil (Uniso, USP, Unesp and Umesp) to work on the project “From fait divers to Jornalismo Literário: Towards a Historiography of Transatlantic Literary Journalism.” Drawing on historiographical, postcolonial and intermedial methodologies, as well as on several Digital Humanities technologies, JorLit will trace the various origins, influences and mutations of Brazil’s Jornalismo Literário (journalism as literature as opposed to journalism about literature) over the past two centuries. Its goals are to identify the form’s various manifestations in Brazilian print media and to distinguish how much of that genre emerged from culturally mediated European traditions (particularly French, but also Portuguese), trickled down from North America as a cultural byproduct of soft power, or was home grown as a direct response to or a form of resilience against certain social, economic and political stimuli. Interdisciplinary in practice and transnational in scope, JorLit looks to establish a definitive history of Brazilian (and, by extension, French) literary journalism by plotting the native, French, Portuguese and North American traces of the genre on a geoportal platform that will visually chart the flux and flow of literary journalistic forms and ideas between the several countries. In its efforts to understand the migratory nature not just of the written word but also of the national(ist) ideologies and aesthetics inscribed in any mediatized language, JorLit hopes to provide a functioning research paradigm that could inform the historiographies of other countries’ literary journalism and begin forming a clearer narrative of the genre’s many lives and nationalities. The academic year was dedicated mostly to completing former projects and initiating new ones. In terms of former projects, the second volume of the ReportAGES series, “Literary Journalism and Africa’s Wars: Colonial, Decolonial and Postcolonial Perspectives,” was published. Edited by Andrew Griffith, Audrey Alvès and Alice Trindade, under the direction of series editor John S. Bak, the book explores ways in which early and late examples of literary journalism from England, France, Spain, Portugal and the United States interpolate the aesthetics of war reporting on various fronts and at divergent times in Africa’s history, both reproducing and deconstructing the widespread colonial discourse that lies behind nearly every war, campaign, coup, assassination and pogrom that has scarred the continent over the past century. Although often a product of that colonial discourse, the literary journalism examined in this collection was motivated at least in part by the desire to expose the power imbalances that upheld it. Among the primary sources included in this volume are texts by Henry Morton Stanley, Ramón J. Sender, Martinho Simões, Frederick Forsyth, Kurt Vonnegut, Ryszard Kapuściński, Philip Gourevitch, Jean Hatzfeld and a host of foreign correspondents from Le Monde. Incorporating a wide range of international critical perspectives, this book also assesses the impact literary journalism has had on various nations’ literary war reporting emanating from colonialist and postcolonialist conflicts and how those stories might help to reconfigure certain historical legacies, journalistic heuristics and literary representations of the Africa in the 21st century. By presenting excerpts from several primary sources alongside a contextual gloss and a scholarly essay, the collection highlights the varied effects produced when literary techniques were fused with factual war reporting. As for initiating new plans, the four-year project JorLit, “From Reportage to Jornalismo Literário: A Historigraphy of the French Influences on Brazilian Literary Journalism,” was submitted to the annual ANR PRCI call for projects. Whether or not the project is funded, John S. Bak will return to the Université d’Etat de São Paulo (UNESP) , having been awarded, for a second-consecutive year, on of France’s “Chaires Franco-Brésiliennes dans l’Etat de São Paulo.” To widen the ReportAGES project influence in the Southern Cone, a new project, entitled CRONICA (after the collective Latin American term for literary journalism)n was submitted for an Ecos SUD grant. The project links research centers in Chile and Argentina with several in France to again study the French influence on the development of the crónica in those two countries. 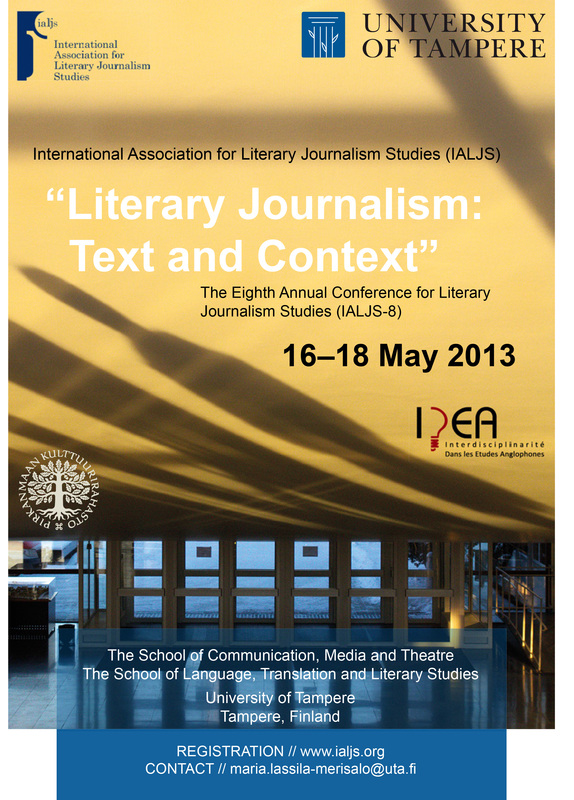 ReportAGES once again joined forces with the IALJS to produce another satellite conference in Europe. John S. Bak and David Abrahamson will co-host a round table at 14th ESSE Conference (29 August–2 September 2018) at Masaryk University in Brno, Czech Republic. Entitled “Literary Journalism and R/Evolution,” the session will examine narratives that provide the necessary insight and political commentary to explain and comprehend the geopolitical changes that have marked the late twentieth and early twenty-first centuries at an accelerated pace. Inspired by political events at the upcoming venue – with the demise of the Austro-Hungarian Empire after World War I, the namesake of the ESSE host university, Tomas Masaryk, became the founding father of Czechoslovakia, and the host city Brno later became an important foci for the Velvet Revolution – the proposed round table session will focus on the nature of social change in all its forms. In January, ReportAGES and I.D.E.A. invited Monica Martinez, from the Universidad de Sorocaba, to present the talk, “Brazilian Literary Journalism: Reports from José Hamilton Ribeiro (Realidade Magazine) on Vietnã and Patrícia Campos Mello (Folha de S.Paulo) on the Syrian War.” While there, he was interviewed by students in the Journalism Department for the local radio; the transcript of that interview was later published in the Department’s academic journal, Tríade: Revista de Comunicação, Cultura e Mídia. In March and April, the ReportAGES project invited two international speakers, Kate McLoughlin, from Harris Manchester College (University of Oxford), and Alberto Lazáro, from the Univerisidad de Alcalá (Spain), to speak about literary journalism and war. While Kate McLoughlin’s talk, “Hemingway vs. Gellhorn and concerns the rivalry on the D-Day beaches and in the pages of Collier’s magazine,” focused on the media warfare between the estranged husband and wife during their coverage of the Normandy invasion of WWII, Alberto Lazáro, in his talk “Reportage and the Spanish Civil War: Orwell, Cockburn, Romilly and O’Donnell,” looked again at the Spanish Civil War and the many literary journalists who covered it, classifying their reportages along a fact-fiction spectrum. A full, two-day conference was held from 13-14 June 2016 on the topic “Literary Journalism and Latin American Wars: Revolutions, Retributions, Resignations.” The conference will be held at Wolfson College, Oxford University. The keynote speaker will be Argentinean journalist and scholar Roberto Herrscher Rovira (Universitat de Barcelona), whose books Los viajes del Penélope (2007) and Periodismo narrativo (2012) show the importance literary journalism has in the practice and history of Latin American letters. The Cambridge Companion to War Writing opens with an acute statement: “How war is written about concerns every individual.” In the case of civil wars, public concern and academic interest has grown in recent decades, since they have a huge impact both within their own societies and on an international scale. Papers are invited which investigate how English texts about civil wars are written. This seminar will cover a wide range of issues, including literary genre, narrative strategies, censorship, propaganda, gender roles and perspectives, from medieval warfare to more modern conflicts in America, Ireland, Finland, Austria, Spain, Greece, etc. Literary journalism – a genre of nonfiction prose that lies at the conceptual intersection of literature and journalism – can be the best vehicle to tell a certain kind of story that reporting often neuters of its emotional appeal and literature inevitably elevates to universal heights that efface its individualistic nature. It can be argued that the cause célébre of the last few decades or so has been immigration, the ineluctable endgame of colonialist agendas. The discourse is global, poignant and often marked by nativism, racism and even violence. The proposed session will focus on ways in which a variety of national traditions of literary journalism have dealt with the immigrant experience, in particularly on how various perspectives (both by individual authors and in national traditions) have explored what it means to be – or, perhaps more importantly, to be view by others as – a stranger in a strange land. For a summary of both ESSE panels, click here. A full, two-day conference will be held from 5-6 June 2015 on the topic “Le journalisme littéraire et les guerres en Afrique : perspectives coloniales, décoloniales et postcoloniales” / “Literary Journalism and Africa’s Wars: Colonial, Decolonial and Postcolonial Perspectives.” This conference, which will be held on the Nancy campus of the Université de Lorraine, hopes to bring together scholars of literary journalism, reportage, le journalisme littéraire, jornalismo literário, el periodismo literario, literaire non-fictie, giornalismo letterario and literarische Reportage from England, the U.S., France, Belgium, Portugal, Spain, the Netherlands, Italy and Germany to discuss a topic that has received little attention in the academic community: Africa’s colonial wars at the interdisciplinary crossroads of literature, history and journalism. Patrick de Saint-Exupéry, cofounder and editor-in-chief of the magazine XXI and author of three reportages on the Rwandan genocides, L’inavouable, La France au Rwanda and Complices de l’inavouable, will be the conference keynote speaker. 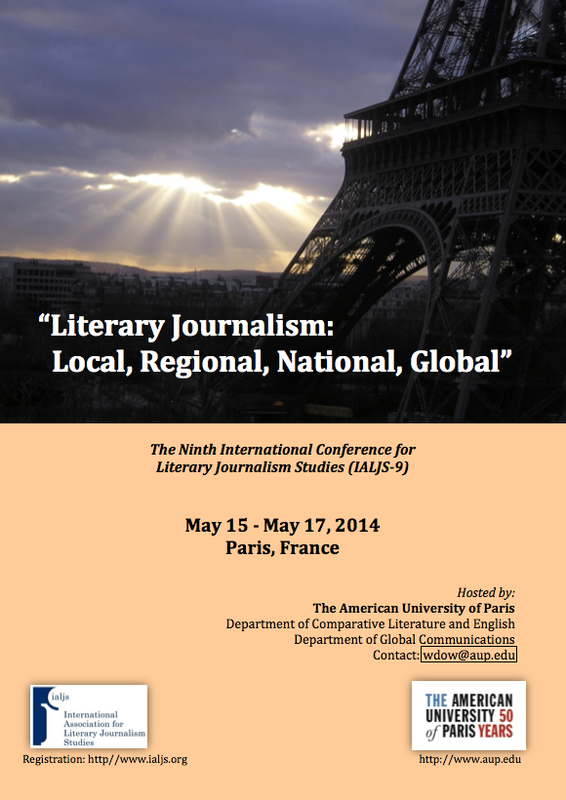 In May 2014, John S. Bak put together another panel for the annual IALJS Congress, this time held at the American University of Paris. The panel title was “War, Tragedies and Disasters in Literary Journalism” and included talks on World War I trench journals, “Militainment in the Context of War Literary Journalism” and “Euclide da Cunha’s Os Sertões: Literary Journalism of a Place and Time,” a reportage about the Brazilian Civil War. You can view the entire panel by clicking here. An IDEA Seminar Series evening is set for 3 December 2013. Talks include “Deux écrivains-journalistes belges dans la guerre d’Espagne: Mathieu Corman et Charles d’Ydewalle” by Paul Aron (Université Libre de Bruxelles) and “Journalism of attachement ? La Guerre d’Espagne vue par Gellhorn, Viollis, Taro” by Isabelle Meuret (Université Libre de Bruxelles). In March 2014, John S. Bak was interviewed by students of the Collège Jacques Callot as part of the project on World War I. The interview was recorded, edited and later ran on France 3 radio. A one-day conference will be held on 7 June 2014 on the topic of “Le journalisme littéraire et la Première Guerre Mondiale” / “Literary Journalism and World War I.” Speakers from France, Belgium, England and Germany will be invited to participate. The conference will be sponsored in part by the Conseil Général, which is currently applying for World Heritage recognition from UNESCO for various sites in Lorraine related to the Great War. Click here to see the book proposal. Literary Journalism and World War I: Marginal Voices, the first volume of the ReportAGES book series (General Editor, John S. Bak), was published in November 2016. Edited by Andrew Griffiths, Sara Prieto and Soenke Zehle, the book combined external articles with a few of those read at the 2014 conference. In addition to the nine scholarly articles, the book reprints original extracts of literary journalism from World War I, as well as a short contextual gloss, both of which will soon be made available online in the ReportAGES project web and app. project. In May 2014, literary journalist and scholar Roberto Herrscher, from the Universitat de Barcelona, presented the following talk in Nancy as part of the ReportAGES research project: “Reflections on My War: What I Lived in the Falklands, What I Read to Write it and How I Found the Way to Tell My Own Story.” Veteran of the Falklands/Malvinas War in 1982, Herrscher found the way to tell his story by leaving the costume of the veteran and investigate it as a literary journalist. In that trip, he learned that what he needed to tell was the story of others, not himself. The result was the book The Voyages of the Penelope (hard cover and paperback in Spanish by Tusquets, 2007 and 2009, paperback in English by Südpol, 2010). The project actually began, informally, in 2012 with invitations extended to two speakers from abroad (USA and Germany) who dealt with the topic in varying ways. John Hartsock (SUNY, USA), a major scholar of literary journalism, presented the talk “War, Literary Journalism, and the Aesthetics of Experience” on 8 March 2012, which focused on the paradox of dealing with the horrors of war reporting through details of the banal. Literary journalism editorializes through its details, and often these details are banal with respect to the backdrop of war, but it is those banal details that allow us to humanize an inhuman concept of war and bring the readers closer to the tragedy of war. To shock them with horrific details does not allow a reporter to capture the horrors effectively as a photo can do visually. So literary journalism uses the banal and the everyday (a woman in Hiroshima puts winter coats on her children just after the bomb is dropped, although it is summer time) because we can identify with these daily routines, we position ourselves in the subject’s place, therefore narrowing the gap between their horror and our reading of it. The second talk by Soenke Zehle (Academy of Fine Arts Saar) was titled “Secrecy Wars: New New Journalisms and the Cultures of Anonymity”. Zelhe explored the role of the new new journalists, whose literary journalism is more fully researched than its new journalist brethern’s of the 1960s and 1970s, and how these second generation literary journalists are helping us to understand the data overload that we are faced with daily in the war against privacy. Two examples that Zelhe provided were Michael Lewis’s books The Money Culture and Panic: The Story of Modern Financial Insanity. The latter is about understanding the financial crisis, and it was so well analyzed that it began to inform governmental policy on predicting the financial crisis. He also discussed how various journalists are wading through the piles of important documents and information data that has been uploaded by the whistle-blower website Wikilinks. The literary journalists are forming narrative patterns around the hundred thousands of documents so that we can understand what the data means. Without these narrative frameworks, the documents would mean little to the general public, who would hardly invest the months of reading time necessary to understand what sensitive information the documents are exposing. 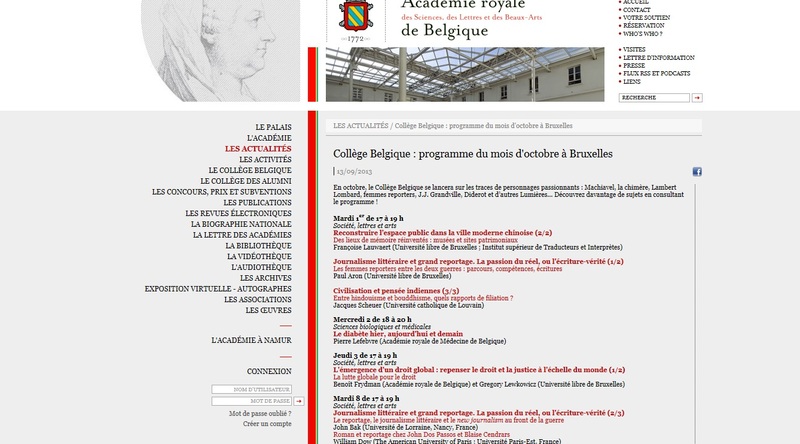 The talk, held at the Palais des Académies, was organized by Isabelle Meuret of the Université Libre Bruxelles and sponsored by the Belgian academicienne Valérie André. The project has drawn the attention of international doctoral students and post-doctoral students. Talal Hawshar, a second-year, co-tutelle PhD student from Masarykova Univerzita (Brno, Czech Republic), is looking into the American cultural wars recorded by the New Journalist of the 1960s. His thesis is on the specific case of the counterculture, the insurgent effect lies in the reprogramming of the communication networks that constituted the environment of artificial hazards in the minds of Americans, thus creating counter-frames with higher relevance value and re-calibrating reactions to artificial hazards. The cross-reference between the texts, the replication of the same themes by different authors, their social and political engagement, performance, and rallying are some of the factors that helped increase the relevance of their representations. Talal will argue that it is the practice of literary journalism, often by members of the counterculture themselves, which was the crucial factor in propagating this alternative culture and thus overriding corporate media and becoming one of most significant factors in changing people’s views on American politics and social norms. Carolina Goos just started her PhD thesis, entitled “Journalisme de Paix et Journalisme de Guerre. Le reportage sur la migration dans la presse parisienne 2016-2018.” Looking into literary journalism’s role in the coverage of the migrant camps in northern France, the thesis will be co-directed by John S. Bak (I.D.E.A.) and Myriam Boucharnec (CSLF – EA 1586), Université Paris Ouest Nanterre La Défense). Lilian Juliana Martins, a recent PhD student from the State University of São Paulo “Júlio de Mesquita Filho” (UNESP), worked with John S. Bak in Nancy from August to December 2017 as a Visiting Researcher. Her residency in Nancy — entirely funded from a research grant through Coordenação de Aperfeiçoamento de Pessoal de Nível Superior (CAPES) — allowed her to advance the theoretical nature of her thesis, entitled « Jornalismo Literário em Antônio Callado: a literatura na construção da narrativa jornalística sobre o Brasil », which examines the literary journalistic features of O Esqueleto da Lagoa Verde, Vietnã do Norte: o outro lado da Guerra and Revolução piloto em Pernambuco. Federico Casari, currently teaching at the University of Tübingen, chose to work with the ReportAGES project on a post-doc project entitled “Italian Literary Journalism.” He applied for a two-year Marie Sklodowska-Curie Action grant. Although the proposal was not accepted this year, he was awarded the Marie Sklodowska-Curie Actions Seal of Excellence. This quality label is awarded to all proposals submitted to the MSCA Individual Fellowships Call that scored 85% or more but could not be funded from the call budget. A recent PhD graduate, Antonio Cuadero, from the Facultad de Ciencias de la Comunicación of the Universidad de Malaga, worked with John S. Bak for ReportAGES on a two-year post-doc project that will look into the crónica in literary journalism in Ibero-América. Antonio is now editing the fourth volume of the ReportAGES book series, entitled Literary Journalism and Civil Wars (PUN 2019). The long-term plan is to seek ANR funding. And recently, the project JorLit has been submitted as part of a joing PRCI project between France and Brazil. In the past, a consortium of fifteen universities, institutes, and cultural entities has submitted a dossier to the H2020 “Reflective Societies: Cultural Heritage and European Identities” (Reflective-5 action: “The cultural heritage of war in contemporary Europe“). For the moment, the individual partners are many (coming from England, the United States, Spain, Brazil, Portugal, and Argentina, to name but a few). On the institutional level. the Oxford Centre for Life-Writing at Wolfson College, Oxford University (UK), the Medill School of Journalism at Northwestern University (USA), the ReSIC center of communication studies at the Université Libre de Bruxelles (Belgium), and the Experimental Media Lab at the Academy of Fine Arts Saar (Germany) have accepted to join the project. The OCLW is a research center on “Life Writing” which held a conference in 2013 on “Life Writing and War” and which will hold a future conference on literary journalism and war and sponsor a visting scholar. The Medill School, through the partnership of David Abrahamson there, has agreed to offer the School’s services to the project. Isabelle Meuret will be the liaison with ReSIC, and Soenke Zehle will join us from the xm:lab. The IALJS will always be a central sponsor to project, offering its support when available. The project also dovetailed with the Conseils Généraux de Meuse et de Meutre-et-Moselle‘s dossier project destined for UNESCO, “Paysages et sites de mémoire de la Grande Guerre”. In the spring of 2014, IDEA sponsored a one-day conference on literary war reporting in and eastern France during World War I. Two additional talks scheduled for 3 December 2013 to further the discussion of literary journalism and war begun back in 2012 with the IDEA Seminar Series. In the long term, the project will also seek to produce university degrees based on the research conducted. There is potential for doctoral students and post-docs. A web designer will also have to be contracted to design, construct and run the website linked to the project of disseminating various documents related to particular sites of literary war reporting (allowing open access to the texts themselves, but also letters, photos, memorabilia, etc. linked to the creation of those stories).